Chinese Foreign Ministry Spokeswoman Hua Chunying has held a press conference where she discussed recent events while taking questions from journalists. The overall weight of her remarks speak to the fact that China is getting increasingly fed up with India’s failure to engage in dialogue with China over the Doklam/Donglang border dispute as well as other areas of the China-India frontier whose demarcations are not universally recognised. In her statements Hua also affirmed China’s commitment to its manifold partnership/friendship with Pakistan while subtly warning Donald Trump not to insult Islamabad’s commitment to peace in South Asia. “In recent days, Pakistan’s Foreign Secretary Tehmina Janjua visited China. State Councilor Yang Jiechi, Foreign Minister Wang Yi and Assistant Foreign Minister Kong Xuanyou met with her respectively. The relevant press release has been issued. The Chinese side said that China and Pakistan are all-weather strategic cooperative partners and the two sides always firmly support each other on the issues concerning each other’s core interests. Against the backdrop of the complex and volatile international and regional situations, the strategic significance of the China-Pakistan relations has become more prominent. The Chinese side appreciates the efforts made by Pakistan to fight terrorism and safeguard the security of the China-Pakistan Economic Corridor and is willing to strengthen all-round cooperation with Pakistan so as to achieve common development. Foreign Secretary Tehmina Janjua said that China and Pakistan enjoy ironclad friendship and no matter how the political situation changes in Pakistan, its friendly policy towards China remains unchanged. The Pakistani side will as always firmly stand together with China on the issues concerning China’s core interests and join hands with China to advance the building of the China-Pakistan Economic Corridor and continuously move forward the bilateral relations”. In describing the friendship between Pakistan and China as “ironclad” while emphasising the importance of the China-Pakistan Economic Corridor all the while rebuffing Donald Trump’s statements which said that Pakistan isn’t doing enough to help foster peace in Afghanistan, China has shown that it is willing to stand by its Pakistani ally on several fronts including, trade, infrastructure, peacekeeping and regional stability. With China’s firm commitments to Pakistan, it will be unlikely that any American economic threats to Pakistan will have the impact they would have had in recent decades. Furthermore, China’s firm commitment to Pakistan’s sovereignty implies that China will at the very least condemn any further US drone strikes on Pakistan’s soil, strikes which in the past, the US conducted with impunity, often killing civilians in the process. “According to the report of the Hindustan Times, recently, India’s Union Ministry of Home Affairs (MHA) has cleared a proposal to construct a road from Marsimik La to Hot Spring. Marsimik La is only 20 kilometers away from the northwestern tip of the Pangong Lake. The Indian media said that the road will give Indian security forces in the remote regions the access to the disputed areas of the China-India boundary so as to “ensure the strength of the Indian border troops”. What is your comment”. “This report makes me feel that India is slapping its own face. The Chinese side constructs roads on its own territory, but India illegally crossed the boundary to obstruct that under the so-called pretext of ‘security concerns’. Now the actions of India exactly prove that on the relevant issues concerning the China-India boundary, India’s deeds cannot match its words and what it did is inconsistent and contradicts with what it said. The western sector of the China-India boundary has not been delimited. China and India have agreed that pending the final settlement of the boundary issue, they will make concerted efforts to uphold the peace and tranquillity of the border area. India’s construction of the infrastructure which is obviously for the military purpose near the Line of Actual Control in the western sector cannot help to uphold the peace and stability of the western sector of the China-India boundary or ease the current situation of the boundary between the two countries”. The Chinese position remains clear. While China legally builds roads on Chinese territory, India is sending troops and builders into non-Indian territory. She further accused India of effectively disturbing the peace and failing to take appropriate measures to ease the current tensions. In many ways, the most startling aspect of the recent flare-ups along the Sino-Indian border is that China has remained so calm in the face of Indian provocations that have not been accompanied by any apparent willingness to discuss the issue in a diplomatic forum. The forthcoming BRICS summit which will begin on August 31st in Xiamen, located in China’s Fujian Province will be the first time that the Indian and Chinese leadership will have met since the commencement of this summer’s stand-off in Doklam/Donglang. This could present India with an opportunity to once and for all speak directly with China at the highest levels about the issues. As BRICS members, India, China and Russia are also members of the Shanghai Cooperation Organisation (SCO). In this sense, the BRICS meeting could also theoretically pave the way for a conflict solving session among SCO members. Russia which retains good relations with both China and India could almost certainly mediate in the dispute, but this is only possible if India admits that dialogue must begin at once while further provocations must cease. By contrast, the summit could inversely reveal the growing schism between Beijing and New Delhi if Indian Prime Minister Modi refuses to speak about the issue, which clearly China is eager to resolve peacefully. In six days time, India and Mdo in particular will be put to the test. 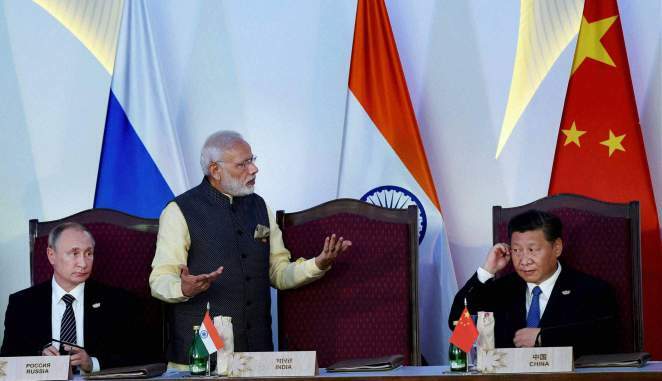 Modi can either maturely utilise the BRICS and SCO to bring an end to the conflict, or otherwise prolong the conflict, making many fellow BRICS and SCO members begin to doubt India’s international commitments and its wider commitment to diplomatic problem solving. It is of course in India’s economic and geo-political interests to work with the BRICS and SCO to solve the crises amicably. The prolonged conflict is counter productive in respect of India’s own economic advancement or as China stated, India “slapping its own face”. The post Chinese Foreign Ministry stands behind Pakistan, criticises Trump and SLAMS India appeared first on The Duran.